Marineland Fluorescent Recessed Full Hoods are designed to fit securely into the frame of Marineland aquariums and other standard-size fish tanks. 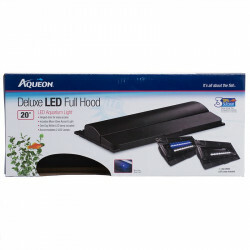 The hood features a white reflector that delivers more light in the aquarium, and instant-start capability with the option of adding a timer. The front access panel runs the entire length of the hood to make daily maintenance and feeding easy, with a No-Drip feature and sealed-glass shield to help protect electrical parts from moisture and corrosion. The textured surface won't show fingerprints. Replaceable rear plastic back strip may be cut to fit heaters, filters, and other accessories. Note: Formerly sold as Perfecto Fluorescent Recessed Full Hood. I was nervous about whether or not it would fit since I wasn't sure whether to measure the tank inside length and width, or the outer edge length width, but speaking to a rep on the phone they recommended this one per my measurements and once it arrived it was a perfect fit! They know what they're doing and I very much appreciate it! The tank lid is nice and clean and crisp, and the lights fully illuminate the tank! Exactly what I needed. Fits my aquarium perfectly. Good quality product at a good price. Light bulb included. On time delivery. This hood fits perfectly and the lid opens and closes as it should. The light bar pulls up off the glass for bulb replacement and cleaning. Great product! Have this light on a 55, 20, and three 10 gallon tanks. Works great on all of them. The only thing I wish is that I could order replacement the breakout area as one of the tens broke badly and left an area that fish can jump out. 5/5 since that was not a fault of the lights. Perfect fit, great value, love it. Arrived on time and as described, this was the only place I could find a 48 inch hood, I'm thankful it worked out! 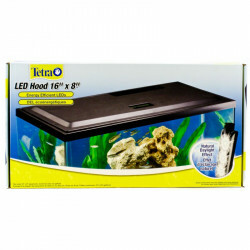 Perfecto Fluorescent Recessed Full Hood BlackPerfecto 2 Piece Hood - 48"L x 13"W - 40E, 55 & 60 Gallon - (Includes 32 Watt 48" Bulb) This item was perfect for my tank! It brightened up my tank and was easy to install. I think I will order another one for my other 60 gallon tank. I recently ordered the 24 x 12 aquarium hood for my 55 gallon tank. My opening is slightly smaller than the hood measurements listed but by reading previous reviews I was able to determine the actual hood measurement is smaller than the listed 24 x 12. Hood fit and matched perfectly to the original hood on the tank. The light works. I'm very happy with this product. This cover fit my 20 yr. old 30 gallon tank perfect and the bulb included was nice bright white light. I bought a 29 gallon tank w/out a hood light. Went online and found this site and saw this hood and figured why not. Received it today and fits great, looks great and worth the money. Would definitely recommend this. My tank is an Aqueous brand tank if that helps. I recently purchased the fluorescent hood. 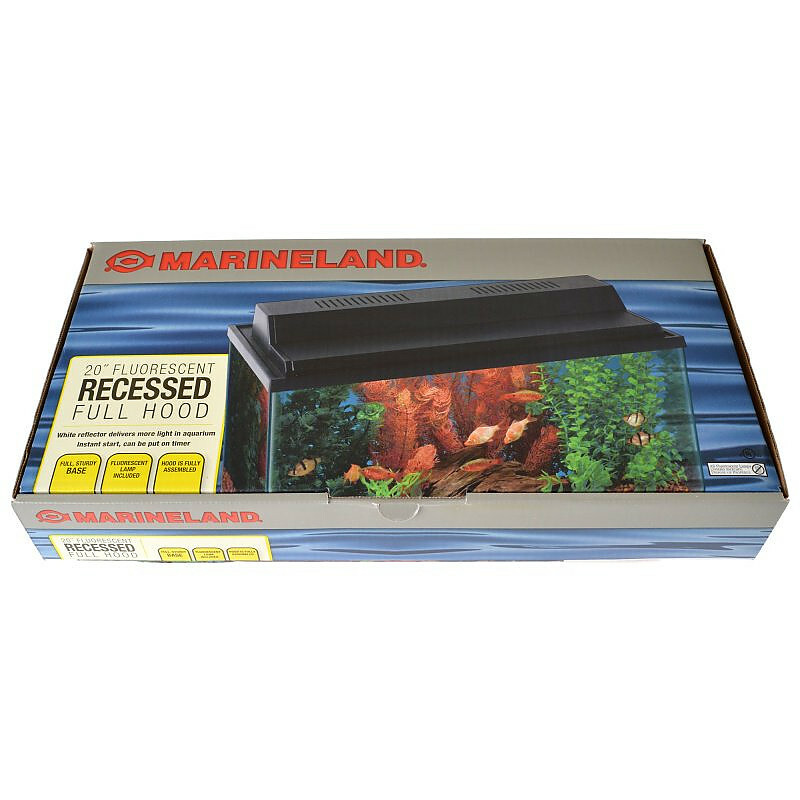 I did not know what I was going to expect because I have been through several hoods (purchased a Marineland hood prior and did not have any luck as it went out monthly! ), so I decided to try this one. So far I LOVE it! It lights up my whole aquarium and fits perfectly! I also like the convenience of feeding my fish in the front opening. I did have trouble with the back but after the struggle, it was still what I was looking for. Have ordered aquarium supplies from Pet Mountain several times and was completely satisfied each time… products arrived quickly and intact… my Go To place when I need something in a hurry. I read the reviews and expected the hood to be a little smaller but it wasn't so small that the hood would fall into the tank. It does have some wiggle room but the outer lip fully covers the top. The light that came with it is good. I had bought a Floramax bulb for my live plants but they kept dying so I put the original bulb back in and I can start to see some growth in my plants. I bought this hood to use on an old tank of unknown make. Although the hood says it is 24 inches long, it is actually slightly under that. Luckily for me it is the stated width, and so I am able to use it, but it is not actually supported on the ends. The light color has a greenish tint, which was unexpected but quite attractive. This hood is exactly what I was expecting/needed. Fits very well and the amount of light is great... lights up the bottom of a 24" deep tank very well! This aquarium hood fit perfectly and tightly. It is very well made and sturdy and the light fixture (with bulb) is excellent. My only small complaint is that it is so well made it was a tad difficult to nip out the space on the back for the filter. I would buy this brand again. Had concerns that the hood would not fit but it fit my 30 gallon "All Glass Aquarium" perfectly. Was worried because aquarium was purchased in 1993 and cannot find All Glass Aquarium hood. Price was $10 less than anywhere I looked both online and in-store. I purchased this product for my son's aquarium - he was given a 55 gallon tank with no lid. I have been to all pet stores. You know, the big name brand stores. They all were around $100.00 and had to custom order. With around 3 weeks delivery. This was much less and fit perfect. Fast shipping and perfect fit. Thanks PetMountain. Item was as described but make sure you measure the size of your tank. This hood and light worked on my tank but was a little short on the width. After calling the excellent customer service representative, we figured out my tank was 20+ years old and for some reason the measurements were different then. It worked and that's all that mattered. Very happy with it. Looks and fits very nice on the tank. I bought two 24" long fixtures to cover a 48" long tank. They were a perfect fit. Delivered quickly & in one piece as always! It makes my tank look so much better...wonderful. Front access panel is warped and one side sits a 1/2" off the base when closed. Looks ridiculous. Light works. Great hood and REALLY fast shipping. I would use this website again definitely. I got the 30 gallon light with hood. It came in the mail very fast. Excellent product that fits perfectly. Highly recommended site. Will order future products from this site, thank you. It 's a nice light, Well built, but the size was not correct. The size said 36"L x 13"W. The one I received measured 36"L X 11 1/4 "W . So I had to add a spacer . Should have sent it back. But I had already set up the tank and was waiting for the hood. 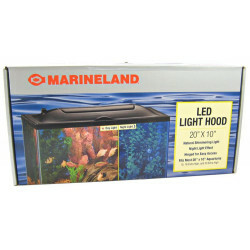 I purchased the 15 & 20H Gallons - (15W - 18" bulb - 24"L x 12"W x 3"H) hood. The actual measurements for this item are 22 7/8 by 11 7/8. I'm a bit crafty so I placed a plastic strip along the inner lip of my 20 gallon H tank so that it does not fall into the tank and electrocute my fish. The lighting is excellent but I would not recommend if you 're expecting this to fit a 20H tank. The product fits great on top of the tank. A really good beginners hood. Works great and for a great price. If you're doing a planted aquarium, you may need more light, but for general purposes, it's great. Decent hood for an affordable price. GOOD: It covers my 20L fish tank, which is a good thing. BAD: The bad thing is that the fluorescent bulb is broken and it takes awhile to start. I can hear something is moving and clinking inside the bulb, when I pick up to place the hood to cover the fish tank. This is no small item to exchange through the mail. For this reason, I must deduct two paws. Good price, good shipping time, better than expected! Great and solid fit for my 10g Perfecto glass tank. Nice big lid for feeding and doing water changes. Easy to remove entire hood. Light is very bright although it does not fully illuminate the front top surface of the tank - not that favorable for viewing top-swimmers. The back plastic is easy to cut if you want to fit a hang-on filter. Overall looks great in black and looks expensive with quality to justify the price. fish are happy, I am happy!! Thanks, great svs. I bought 2 of these hoods and they arrived a lot sooner than I expected. They look great, they work great! All for a great price!!! Very very happy with the hoods. I also love how the hoods came with the light bulb already attached! Most other hoods you have to buy the light separately. Love your site petmountain! I am a loyal customer!!! I love this aquarium hood. It adds a natural glow to my fish tank. Would highly recommend this product for any type of aquatic uses in any type of business or home area.